In 1870, Mary Ann is unmarried, unemployed and pregnant. On a dark Melbourne night, she stands on the bank of the swollen Yarra, contemplating her fate when she spots a small figure fall into the water. Without thinking, she plunges into the river to save the child, who clings to her with more force than any other child she has known. When she wakes, Mary Ann discovers that she has rescued General Tom Thumb, dwarf and star of the troupe of Little People touring Australia. Her impulsive bravery is rewarded when the travelling company offers her a job and an eventual passage to the New World. However, all is not as it seems, and as the tour crosses Australia’s deserts, rivers, towns and cities, Mary Ann begins to wonder just what she has gotten herself and her unborn child into. 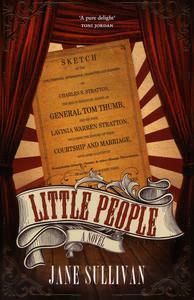 Inspired by the time General Tom Thumb and his fellow dwarves spent in Australia as part of their world tour in 1870, Little People is a rollicking read. Jane Sullivan captures the theatre of the travelling circus beautifully, offering a glimpse into the world of the freak show in a time long-gone. Tom Thumb, his wife ‘the Queen of beauty’ Lavinia Stratton, her sister Minnie Warren and the General’s rival, Commodore George Washington Nutt, were incredibly famous across the world, brushing shoulders with royalty by day and performing to huge crowds at night. Mary Ann thinks her prayers have been answered when she is welcomed by this glamorous outfit, especially when The General and his wife offer to adopt her unborn child as their own, but as the tour continues, the motivations of almost everyone she meets seem more and more sinister. Rendered almost completely powerless, as so many women were in those days, Mary Ann must use her intelligence and fighting spirit to overcome the many obstacles she encounters. This work of historical fiction is a lively tale that will charm readers with as much flamboyance and intrigue as the General and his co-stars won their audience’s hearts over a century ago. Virginia Millen is an editor and a freelance reviewer.